One could never tell that this tight-knit community was ever in a recession. Organizations, vendors, and businesses alike have aligned to join forces in raising necessary funds for one of their own. Community member, Ray DePauw, of Newark, along side his wife, Nancy, have been the center of an amazing act of kindness for almost three years... and counting. Support has showered this family as Ray battles a debilitating disease known as ALS, (commonly referred to as Lou Gehrig's Disease). What is ALS? Amyotrophic lateral sclerosis (ALS), is a progressive neurodegenerative disease that affects nerve cells in the brain and the spinal cord. In a simple understanding of the disease, it affects the motor neurons that in turn causes muscle degeneration. DePauw, who at the time worked for the Village of Newark, noticed that there was something wrong. "There was no pain at all, just loss of muscle in my left hand and arm". In November 2008, after a surprising visit with his neurologist who confirmed that what he thought was simply carpal tunnel syndrome, was in fact ALS with a prognosis of 2-5 years to live. In January 2009, he received a second opinion from Strong Hospital, sadly matching that of his previous diagnosis. With the shocking news, Ray simply states that he was in denial. "I kept working until a year later I realized that it was then in my right should and bicep. I then had to quit my job." Upon hearing the news of the progression of the disease, Ray and Nancy became enlightened as to someone else in the area with the same disease who sought treatment in India. In speaking with him, Ray then knew what he had to do. To achieve such a goal, Ray and Nancy needed approximately $26K in order to send Ray and a caregiver to India for a one month stay. And with strength and conviction, the fundraising began. This community has been overwhelming with support! A series of events jump started the community in infinite giving! There were endless of hours of preparation for each event which ranged from an afternoon of music and auctions to golf and bowling tournaments. Everyone from musicians and organizations to business owners and residents began donating their time, services, and wares to be able to raise the needed funds. And the community did exactly that! The initial funds completely covered the first trip, along with a follow up trip later that year. Now in the third year of his battle and a third and final trip planned, the community is still pulling for his slowed progression. Exercise programs, chicken barbeque's and a community day where various vendors sold their goods, with all the profits to be offered for what is now called "Ray's Hope", were in full swing. A determined group of friends, family and loved ones pulled no stops in continuing the fund-raising efforts. In accepting his disease, Ray does not let this depress him. "I'll have a moment every couple of months, but it doesn't last long. I feel lucky and sure that I am one of the lucky ones! ", DePauw said. Though Ray has had to give up joyous activities such as riding motorcycle and bicycling with his wife, he has had to give up many of the luxuries that we take for granted. He has had to sell his truck as he can no longer drive. He can't play the drums or play basketball. "I have had to give up 98% of my life", he says. And though Ray's life has changed dramatically, Nancy has stood by his side. Ray commented on her love and devotion and said, "She has picked up the 98% that I lost". From simple chores as laundry and dishes to now being a full time caregiver while maintaining her employment at Roosevelt's Children Center has certainly taken on new form. When will life be normal again? Nancy simply states, "You just find a new norm!" Her balancing act of trying to find the time to address the things that need to be done and finding the time to remain herself is a large task, but well handled. Nancy still rings bells for the bell choir and takes a short amount of time to go tanning once a week. It totally changes your life, but it is what it is. If the roles were reversed, he'd do the same for me. We never thought that this could happen to us. Ray and Nancy's two children, Jarrod and Matt, are also a huge source of inspiration. While Matt is away in Afghanistan fighting for our freedom, Jarrod picks up some of the household chores and any other as needed tasks. Though the treatments that Ray has received come with no guarantees, he is quite certain that without the treatments he would be confined to a wheel chair at this point. In closing, he states "It's not a cure, but it's a decent quality of life"
You do it to experience it... just to save your life! There are still several fund raisers in action or approaching if you would like to contribute to this amazing movement for an extraordinary couple! * Chicken Barbeque on May 1st. Donations are always welcomed and greatly appreciated. You may send any donations to Ray's Hope, P.O. Box 474, Newark, NY 14513 or dropped off at the Lyons National Bank (Newark Branch). You may also visit Ray's Hope on Facebook at http://www.facebook.com/group.php?gid=337861324052. 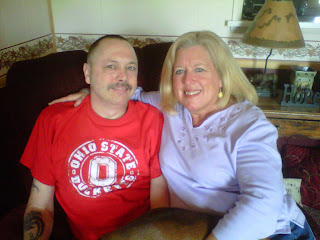 1 Comment to "Community Continues To Raise Hope"
Keep up the HOPE, Ray and Nancy! All of your brothers and sisters at Park Presbyterian Church will keep up the PRAYERS!